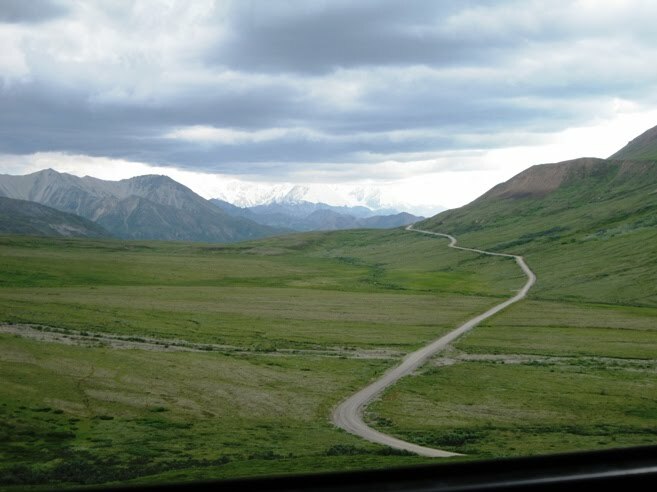 Denali National Park, for the average visitor, is one huge, long bus ride. 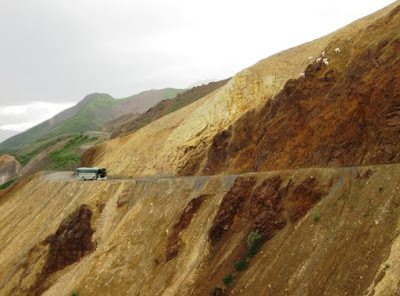 And while it was a fun experience to remember, I just don't think I'd recommend it unless you are going to get off the bus, backpack and camp a little. From what I've heard, Denali State Park might be a better visit. The theory is that there are a ton of buses carrying ticket holding tourists for 4, 6, 8, 12 hour bus rides through the park, allowing you to get off the bus at any point and walk freely through the park, while your bus moves on and you catch another bus whenever you are ready. (Best done in raingear) The Park consists of 6 million acres, spotted with man-eating animals, don't get lost. 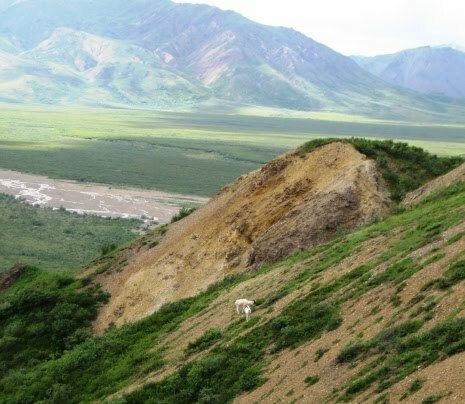 Did you see the two caribou in the valley, toward the right in the photo above? Aren't they adorable? Yes, we think they are. 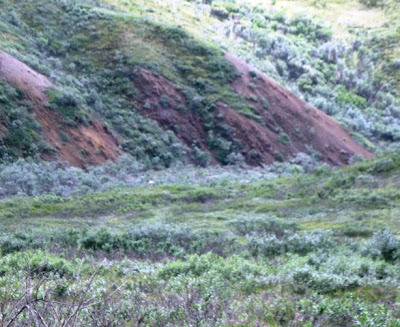 That's why the minute someone spotted them, they screamed "caribou!!" and the bus driver pulled over. We all shifted to that side of the bus, scrunched up against the windows and peeked through our binoculars to see the caribou. Which (removing tongue from cheek) was pretty cool. 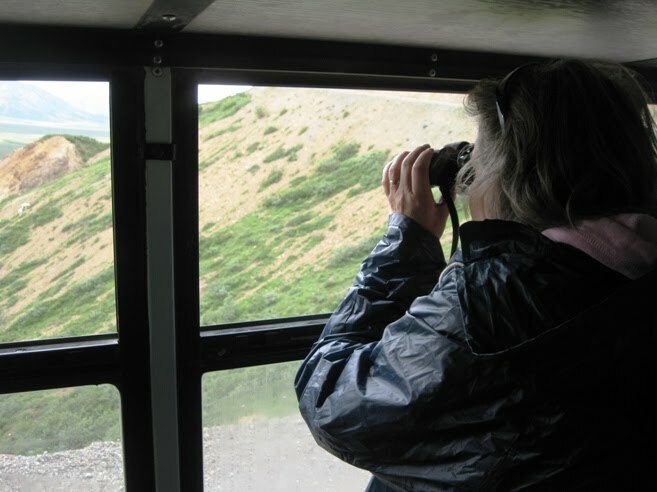 Once I had the binoculars in hand, the whole trip kicked up a notch. We had two different bus drivers and they were both outstanding, friendly, knowledgeable and patient. 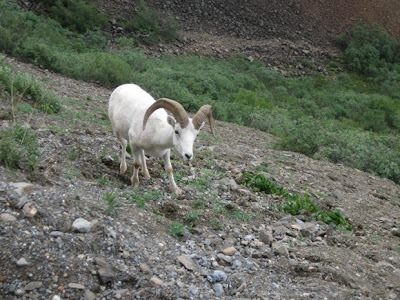 On our visit, the Dall Sheep were the most visible wildlife. Often they came right up to the bus, sometimes crossing the road and moving on. We saw 23. We saw 4 caribou, all very far away. We saw two wolves, one of which was white and our bus driver was so impressed. He said there are only 40-50 white wolves known in the whole park territory. We saw one snow shoe hare, 2 arctic ground squirrels and 1 bald eagle. The highlight, of course, were the 7 grizzlies we saw. They were all blonde. They were all mamas and cubs, adorable! !, and all very far away. You'll enjoy the park/ride much better if you set your expectations properly. Don't expect tons of animals close to the bus. Don't expect tons of animals at all. Do expect some animals. 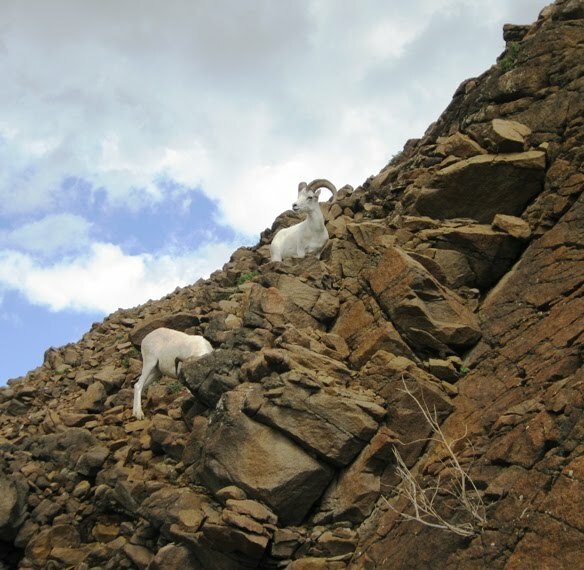 Look for tiny specks of white in the landscape, don't look for dark animal shapes. Do bring a sandwich and beverage for the trip, as well as binoculars. Don't expect too many restrooms or bathroom stops. You will stop to see animals as much as you want. You will stop for bathroom breaks only a few times. Do expect beautiful scenery. Do expect rain. 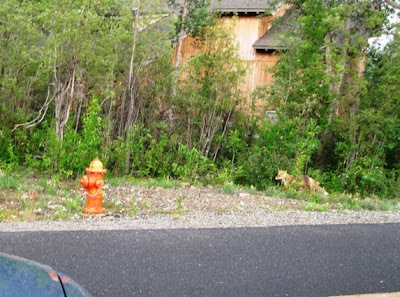 Let's see how well you've become at wildlife sightings. 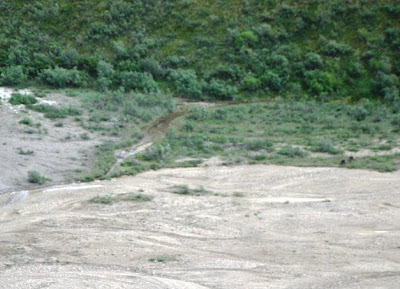 On the picture above, do you see any wildlife? Would you yell for the bus to stop? And if you did that, you would then see something more like this (photo to the right). 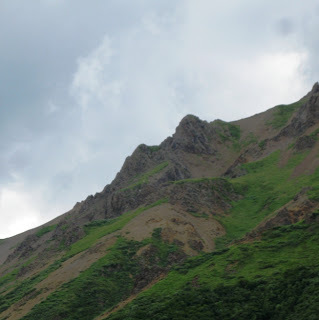 BTW, In the hidden picture test above, there were several Dall Sheep and a mama grizzly with two cubs. I dug out my bincoulars and watched them for quite awhile. Don't expect to see Mt. McKinley, but if you do, it'll be on the 8-hour trip, not the 6-hour. 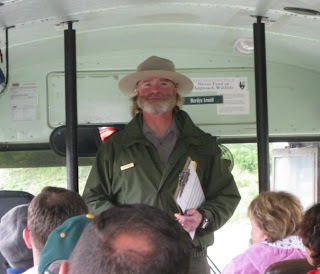 Don't expect much help from the park staff in the office and on the phone if you call ahead with questions. They are not helpful. When you arrive, they still won't be very helpful, you'll have to be a bit pushy. 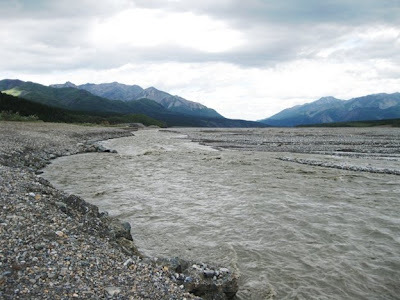 The Savage River is that gray milky water from glacier run-off that I found so fascinating in Alaska. 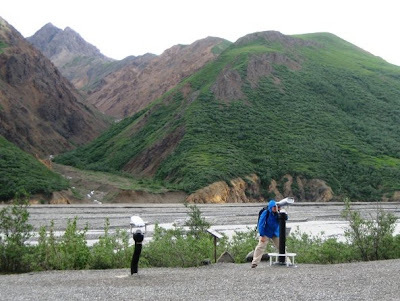 The mountains viewed in the park are part of the 600-mile Alaska Range. 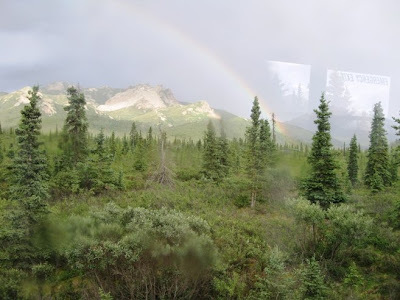 Maybe you will get lucky, as we did, and have this great view as you pass back through the lower boreal forest, which by the way, is the scientific name for what Tom called "The Dr. Seuss Trees" of Alaska. We quietly pulled over and watched him or her for a moment. 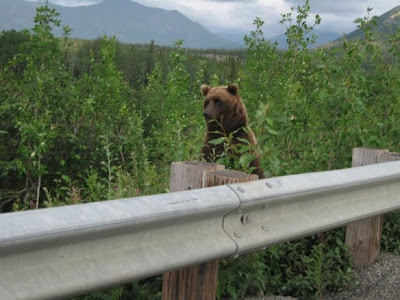 He humorously hefted his big rump over the guard-rail and began walking back towards us with great stealth. 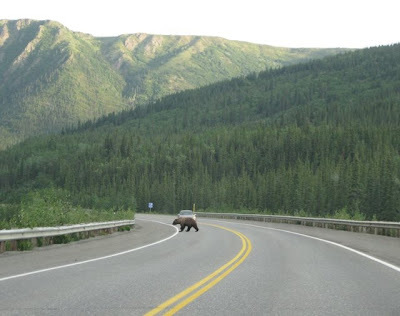 Tom rolled down his window to grab a picture when suddenly, the grizzly stood up and, if he knew English, I swear he would've said with exaggeration, "Rawr!" Tom and I jumped, I screamed and the bear just ambled off. That (again, 10pm) was our final day in Alaska and could we have asked for a more perfect ending?? Well yes, you could, and we did. We pulled over at the Creekside for our usual late dinner and got some home made chicken pot pie that was awesome. However, they are famous for their Moose Burgers, so you might want to try that. Then we drove back the 2-3 hours back to Talkeetna, crawling into bed around 1 or 2 a.m. when it was just starting to get a teeny bit dark outside.